Nebraska produces an estimated 250 million pounds of popcorn per year—more than any other state. This is equivalent to a quarter of all the popcorn the United States produces every year. 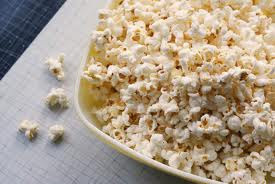 Both the American Dietetic Association and the American Diabetes Association say that popcorn can be exchanged for bread for people on weight control diets. The world’s largest popcorn ball was 12 feet in diameter and weighed 5,000 pounds. It required 2,000 pounds of corn, 40,000 pounds of sugar, 280 gallons of corn syrup, and 400 gallons of water. Two tablespoons of unpopped kernels produce a quart of popcorn for about 25 cents. There are about 1,600 popcorn kernels in 1 cup. Popped popcorn comes in two shapes: “snowflake” or “mushroom.” Because “snowflake” shaped popcorn is bigger, movie theaters typically sell that shape. By volume, popcorn is America’s favorite snack food. In ancient times, people would make popcorn by heating sand in a fire and then stirring kernels of popcorn in the hot sand. When explorer Felix de Azara visited Paraguay in the 18th century, he noted that the people would place kernels on a tassel and then when it was boiled in fat or oil, the grains would burst. Women would adorn their hair at night with the popcorn. Approximately 70% of popcorn sold in America is eaten in the home. The other 30% is eaten in theaters, stadiums, school, etc. Unpopped popcorn makes up about 90% of sales for home consumption. Autumn is the peak time for popcorn consumption, followed by the winter months. Popcorn sales taper off during the spring and summer. Unpopped popcorn kernels are called “spinsters” or “old maids.” Quality popcorn should produce 98% popped kernels with under 2% being spinsters. While it is a popular story, there is no evidence that Native Americans brought the Pilgrims popcorn at the Thanksgiving dinner. While Native Americans in South America, Central America, and the southwestern region of the U.S ate popcorn, there is no evidence that Native Americans in Massachusetts or Virginia did. There are six major maize types: pod corn, sweet corn, flour corn, dent corn, flint corn, and popcorn. Popcorn kernels come in three shapes: rice, pearl, and South American. Most commercial popcorn is the pearl type. The major trait shared by all types of popcorn kernels is their ability to explode and create a flake when kernels are exposed to heat. Contrary to popular belief, popcorn is not the only corn able to pop. Many flint and dent corns also pop, but their flakes are smaller. Additionally, some varieties of rice, milo, millet, and sorghum also pop. Some varieties of quinoa, a sacred Incan food, also pops like popcorn, as does amaranth. A kernel of popcorn contains just a small amount of water. When these kernels are heated, the water turns to steam and the kernels “pop.” Popcorn is different than many other grains because its shell is not water permeable, making it possible for pressure to build up until the kernel finally explodes. Evidence in Peru suggests that popcorn existed as early as 4700 B.C., making it one of the oldest forms of corn. Peruvians didn’t just pop their corn; they also ground it into flour to cook in other ways. The world’s oldest known popper, a shallow vessel with a handle and hole on top was designed around A.D. 300. The first popcorn machine made its debut 1,500 years later at the 1893 World’s Fair (Columbian Exposition) in Chicago. The Aztecs used popcorn during ceremonies. Several young women would dance a “popcorn dance” with popcorn garlands on their heads. They also used popcorn as decoration for ceremonial headdresses, necklaces, and ornaments on statues of their gods. Because sugar was strictly rationed during WWII, candy was not plentiful. Consequently, Americans ate three times as much popcorn during this time as usual. When televisions became popular in the early 1950s, popcorn sales decreased because people stayed home to watch movies rather than go to a theater. However, when popcorn was more readily available at home, popcorn again became popular. Popcorn kernels, like those of all cereal, have three major components: the germ or embryo, the endosperm, and the outer hull called the pericarp. American Indians used to believe that spirits peacefully lived inside each popcorn kernel. When the kernels were heated, the spirits would get so angry that their “houses” would start to shake. When it got too hot, the spirits broke out of their houses in very angry burst of steam. Grains of popcorn around 1,000 years old have been found in tombs in Peru. The kernels are so well preserved that they can still be popped. A 1,700-year-old funeral urn was discovered in Mexico that shows a corn god wearing a popcorn headdress. The scientific name for popcorn is Zea Mays Everta. It is a type of maize, a member of the Maydeae tribe in the large, natural order of grasses called the Graminae. Native Americans would use dried herbs and spices and even chili as popcorn flavorings. Maize (corn) is the second largest crop in the world, and the largest in the United States. Popcorn is approximately two one-thousandths percent of the total crop. More than 200 million boxes of Cracker Jack caramel-coated popcorn are consumed every year in the U.S. alone. The ideal popping temperature for popcorn is 400-460° Fahrenheit. A kernel will pop, on average, when it reaches 347° Fahrenheit.